This method is fairly easy–actually all of them are easy and I use them all depending on the mood I’m in or what I think will look best. Hopefully you will have saved some longish scraps from the post card. 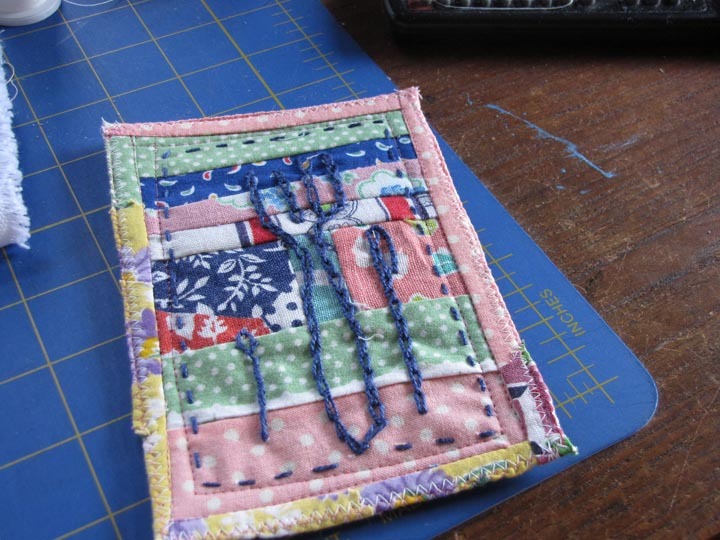 Finish up the postcard including sewing it to the stiffening card and the backing. It does not work well to try to sew them together AND address the edging. Line up the raw edges of the longish scraps along the outside edge of the post card. I usually do one side at a time. Flip the scrap up and press. If the iron is hot, I will use the iron–but lightly. You can sew on all four sides, flipping each side out of the way of the next side. Next fold them over to the back. a pin or two may be necessary or the binder clips may be used. Sew about a fourth inch from the edge all around the outside. Sometimes I zig-zag around the entire card as a finishing touch. This is a good place to use up bits of thread left on bobbins or on a spool that is not enough to use for a large piece. Put that card in clear envelope and mail to some lucky person. If you need pictures—and sometimes I do, here is the sequence. 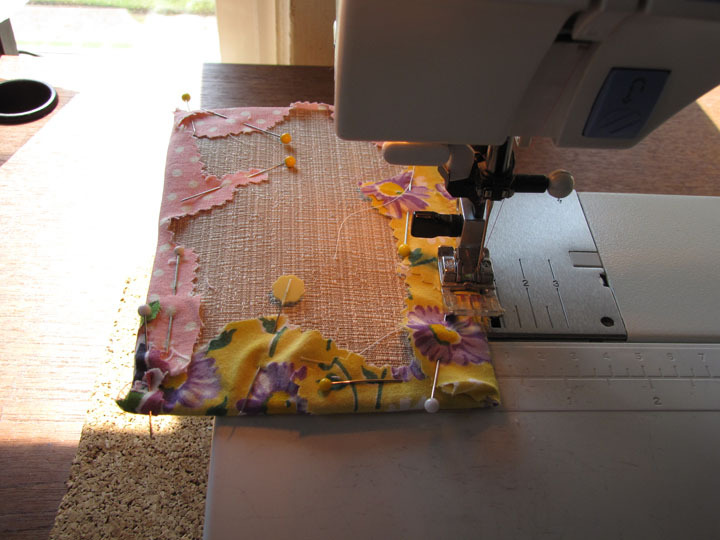 I usually sew around the edge several times–not because it needs more structural strength, I just like that edge. These scraps were cut with a pinking shears and I left them uneven, although I certainly could have trimmed them evenly before I sewed them on or even at this stage–it’s all a matter of preference.